A trajectory may consist of two stages. The first stage uses a simplified representation of amino acids which allows us to try many different possible shapes rapidly. 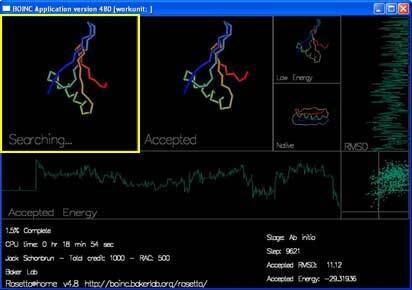 This stage is regarded as a low resolution search and on the screen saver you will see the protein chain jumping around a lot. In the second stage, Rosetta uses a full representation of amino acids. This stage is refered to as "relaxation." 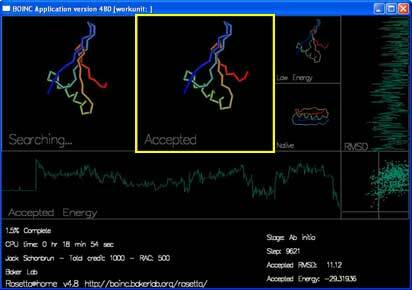 Instead of moving around a lot, the protein tries smaller changes in an attempt to move the amino acids to their correct arrangment. 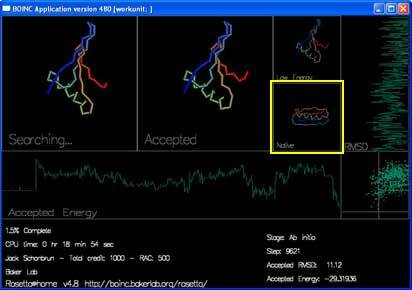 This stage is regarded as a high resolution search and on the screen saver, you will see the protein chain jiggle around a little. 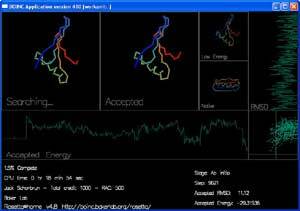 Rosetta can do the first stage in a few minutes on a modern computer. The second stage takes longer because of the increased complexity when considering the full representation (all atoms) of amino acids. There are 4 boxes showing the shape of the protein chain. "Searching..." shows the moves that Rosetta is trying to make to the chain. You can see the shape of the chain by following the rainbow colors from blue to red. "Accepted" shows the most recently accepted move. 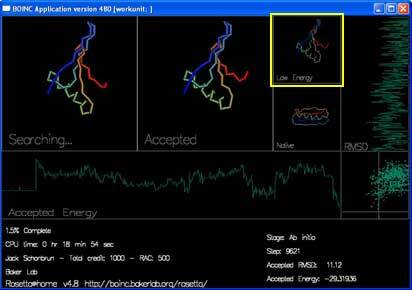 "Low Energy" shows the lowest energy shape seen in the current trajectory. "Native" shows the experimentally determined true shape, if known. 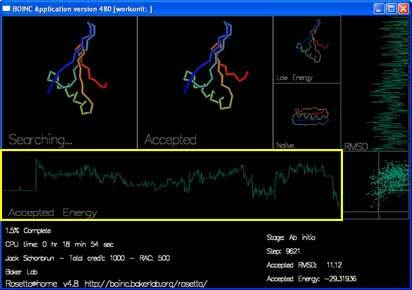 There are also two graphs and a plot that track the energy and rmsd of each accepted move. The final box, in the lower right hand corner, plots the energy and RMSD of each accepted move.